(ARA) – When does a trend become a tradition? With continued interest in creating great outdoor living spaces, the trend for jazzing up the backyard may just be on the verge of becoming a staple of the American home, and as much a requirement as a great kitchen or welcoming bath. More people are foregoing costly summer vacations in favor of sinking that travel money into creating a getaway spot in their own backyards. Enterprising homeowners are using decorative concrete to create mini theme parks with faux rock water features, sculpted pools with water slides and garden bridges. Environmental awareness doesn’t have to take a backseat to luxury, homeowners are finding. Backyard oases must also emphasize eco-consciousness, incorporating environmentally-friendly materials like concrete, which is sustainable. But they also like the organic look and feel that the material can impart. Concrete patios can mimic the look of natural stone – even lava – without the eco-impact associated with quarrying the real thing. Plus, concrete costs considerably less than many natural stone products. Anybody can go to the local home improvement store and pick up a patio set. 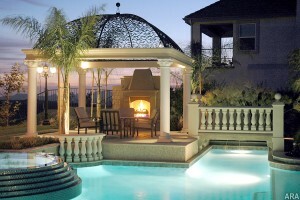 The truly trendy backyard designer turns to permanent backyard furniture, custom-made to fit your yard’s style. Custom concrete furniture can take on any shape, from pool tables and benches to patio tables and planters. It lasts a lifetime and never needs to be painted or refinished. When it comes to creating ambiance, few home improvements pack the wallop of a fireplace. Outdoor hearths are growing in popularity as homeowners continue to recreate all the appeal of their home’s interior outside in the backyard. Whether you choose gas or wood-burning, custom designed or pre-cast, adding a fireplace to your outdoor landscape is sure to light up its appeal. We’ve all seen patio disasters – the sprawling slab that totally dominates a tiny backyard, or the postage-stamp-sized patio that appears lost in a sea of grass. 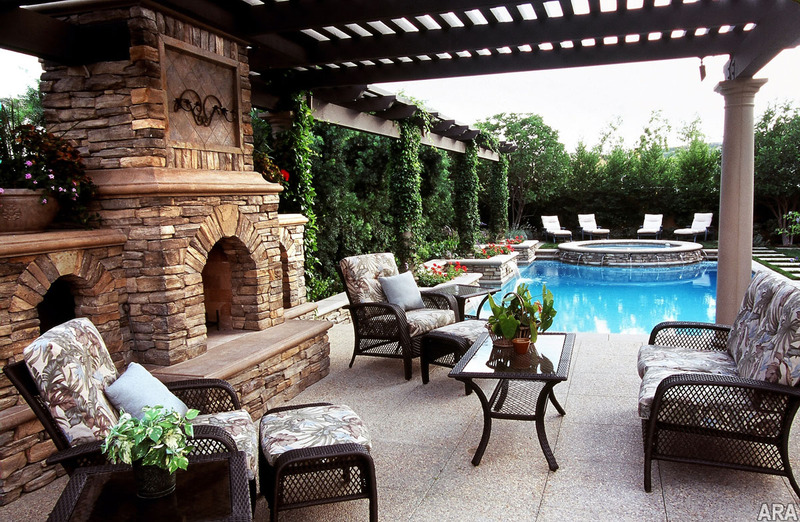 Homeowners are no longer leaving patio size to chance. Instead, they’re putting a lot of thought and planning into right-sizing their patio to create a living area that meets their needs and fits the profile of their backyard. How the space will be used and how much space you have to work with will be main factors in sizing your concrete patio, according to Scott Cohen of GreenSceneLandscape.com. You can also find a patio size chart at www.concretenetwork.com/patio/size.html. Whatever your personal style, and whether you’re aiming to improve your home’s resale value or enhance your enjoyment of your house, upgrading your outdoors is an investment that makes sense. Visit www.concretenetwork.com to learn more.